"A glaze featuring balsamic vinegar, garlic, honey, white wine and Dijon mustard makes baked salmon fillets extraordinary." 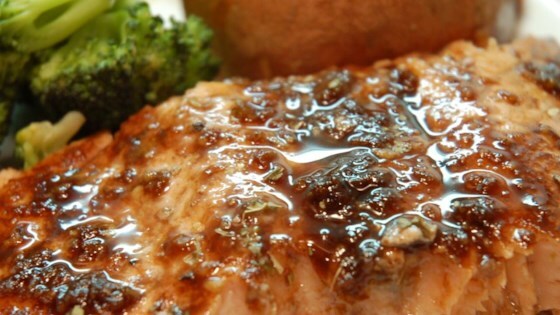 Salmon fillets baked with a balsamic vinegar, Dijon, and white wine glaze. Great recipe. For those who said it should marinate for a few hours -- you can't marinate fish for hours. Max 30 min. You'll partially cook the fish. Fish isn't like meat. The flavors did not seem to mix well together. Will not try this one again.